PLEASE ENSURE THAT YOU HAVE READ YOUR POLICY WORDINGS CAREFULLY. FAILURE TO COMPLY WITH THE TERMS AND CONDITIONS OF THE POLICY MAY RESULT IN COVER BEING RESTRICTED. We offer products from a limited number of insurers for travel related insurance products. We will advise and make a recommendation for you after we have assessed your needs for travel insurance. 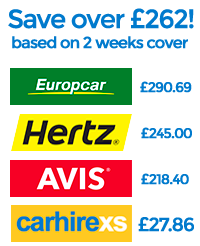 You will not receive advice or recommendation from us for car hire excess waiver insurance. We may ask some questions to narrow down the selection of products that we will provide details on. You will then need to make your own choice about how to proceed. You will receive a quotation which will tell you about any other fees relating to a particular insurance policy. Your insurance is based upon the information provided to the insurance company and you must ensure that all such information is complete and accurate, and that any facts that may influence the insurer’s decision to accept the policy and what terms are applied must be disclosed. Failure to disclose material information may invalidate your insurance and could mean that part, or all, of a claim may not be paid. All personal information about you will be treated as private and confidential (even when you are no longer a customer), except where the disclosure is made at your request or with your consent in relation to administering your insurance, and except where law requires us. Some or all of the information you supply to us in connection with your insurance proposal may be passed to insurance and other companies for underwriting, claims and premium collection purposes. Your data will be held in accordance with the Data Protection Act 1998, under which you have a right of access to see personal information about you that is held in our records, whether electronically or manually. If you have any queries, please write to The Managing Director at the above address. Prior to your premium being forwarded to the insurer, and for your protection, we either hold your money as an agent of the insurer (in which case your policy is treated as being paid for), or we hold it in a client bank account on trust for you. Please refer to your policy summary or your policy document if you need to notify a claim. You should contact the insurer direct as soon as possible using the contact details provided. If in doubt about whom you should contact, please contact us on 08434 590 877. Online Travel Insurance Sevices is authorised and regulated by the Financial Conduct Authority. Registration number is 480416. You can check this on the Financial Conduct Authority's Register by visiting the Financial Conduct Authority's website www.fsa.gov.uk/register/home.do or by contacting the Financial Conduct Authority on 0800 111 6768. Online Travel Insurance Services Limited. If you do decide to refer any matter to the Financial Ombudsman Service your legal rights will not be affected. OTIS This website is part of Online Travel Insurance Services Limited.